The C34 is the first of a whole new generation of highly functional, extremely spacious, incredibly comfortable and very durable mid-size cruisers. The classic raised sheer, high brow and aggressive rake of the command bridge cowl combine to form a very distinctive and appealing profile. Below the waterline, a wide, innovative hull form provides an exceptionally smooth, dry and stable ride when compared with many similar sized bridge boats. 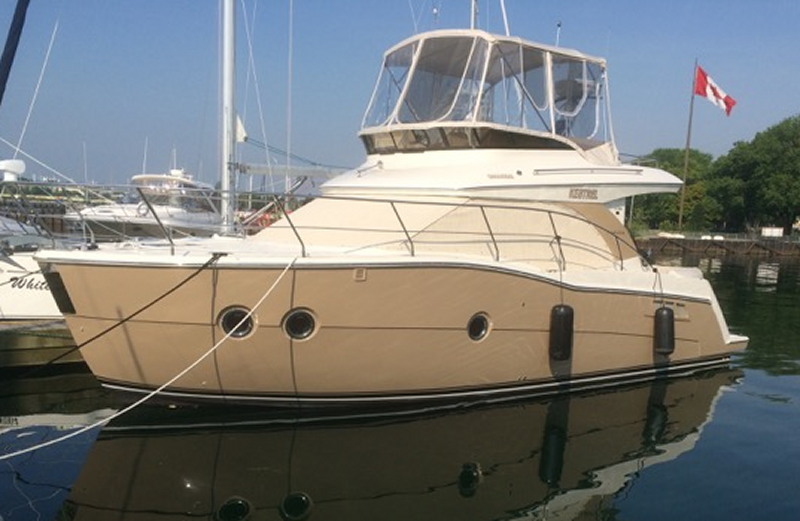 On deck, the sidewalks are wide and safe with tall rails leading to a level foredeck area, and there is easy access to the cockpit from dockside by either molded side steps or the transom door. Below decks, you will find a large, bright salon with double French-style doors that open wide to the cockpit forming a very natural outdoor extension of the interior space. A two-stateroom cabin configuration is very rare in a boat this size, but with a well-earned reputation for maximizing space, Carver has made it all work exceptionally well. The forward berth has an extra-wide island berth with easy access from either side, an overhead hatch and four opening portholes for great airflow and visibility and two hanging storage lockers. The guest stateroom features twin berths that convert to large double berth, lockers and a porthole for natural light, and the salon dining table can be dropped to make room for two additional guests should the need arise. The C34 galley-up design is equally impressive with loads of counter space, all the appliances and storage necessary to make cooking a pleasure. Large opening salon windows provide loads of natural light and a great view of the surroundings for the cook. The C34 Command bridge extends back over a spacious aft cockpit, providing protection from the elements as well as overhead courtesy lighting. A molded stair case makes bridge access a breeze, and a transom door leads to a integral swim platform with concealed storage compartments for equipment and electrical cables. Upholstered cockpit bench seating provides even more storage space below. The bridge itself easily seats seven on wrap-around benches that also incorporate storage, a small refrigerator and stereo system. The pedestal helm seat swivels to face the passenger seating, and the rear bridge extension provides a sun pad area. Kestrel is loaded with factory options, including a bimini top with full enclosure, fitted seat and helm covers for bridge and cockpit, exterior salon sunscreens, water filtration system and all weather carpeting for bridge and cockpit. Major mechanical upgrades include Volvo D4 diesels (+$57,325), 9kW generator (+$21,500), bow and stern thrusters (+$20,810), all-chain windlass with bow and helm controls (+$4,370), high capacity air conditioning (+$12,685 and radar mast (+$7,730). A complete Genco custom winter cover is also included. Carver performance tests show the D4 diesel configuration achieving 4.73 NMPG at 1000 RPM (6.15 KNOTS) and 1.14 NMPG at 3000 RPM (22.8 Knots) - far superior to results for the standard 300hp Mercruiser configuration. Kestrel tops out at 29 knots (36 mph) and gets on plane in a mere 8.6 seconds. Located off-site – please call in advance to book a viewing appointment.